Rick & Morty, D&D, and PAX West. 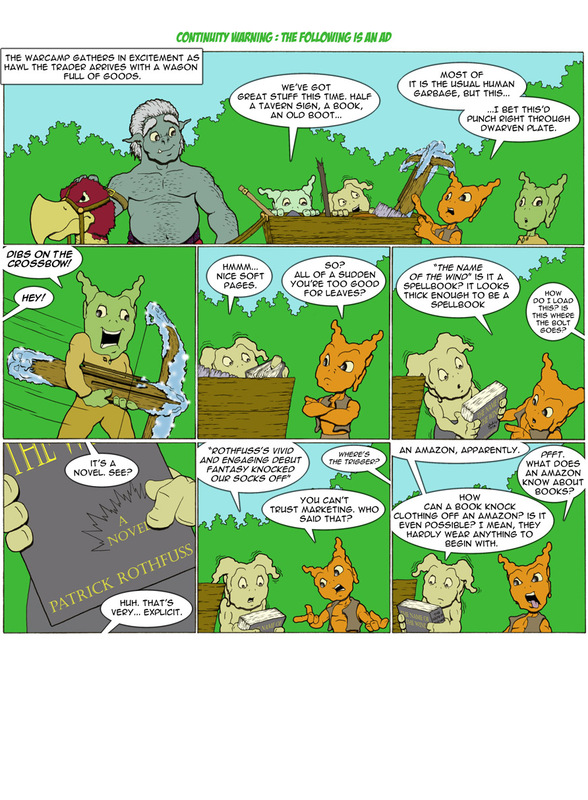 The first of the Rick and Morty D&D crossover comics I’ve been tinkering with for months just came out. I’ve read them before, but oh, it’s nice to actually be able to go to the comic shop and hold them in my hand. 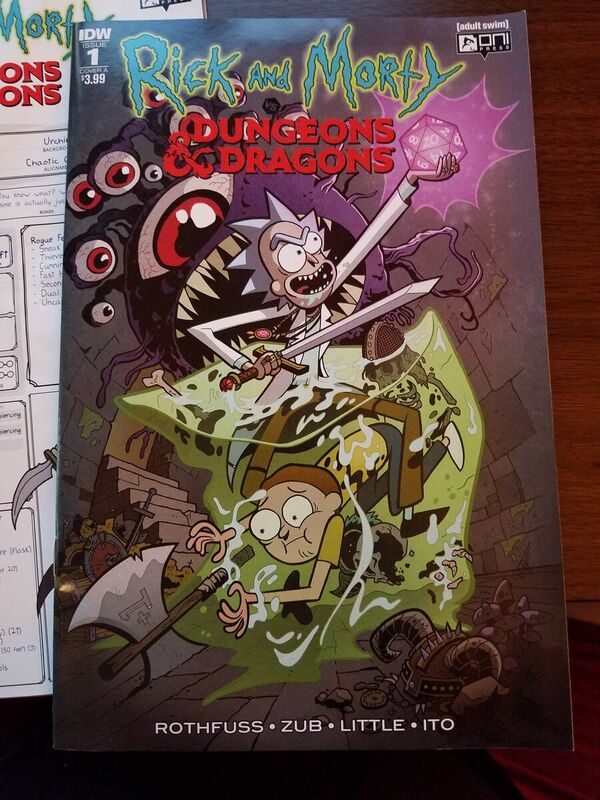 Here’s an alternate cover that shows Morty’s character sheet…. So… yeah. a thing I wrote is out in the world. It feels nice. I’m genuinely proud of some of the banter that I did in there. 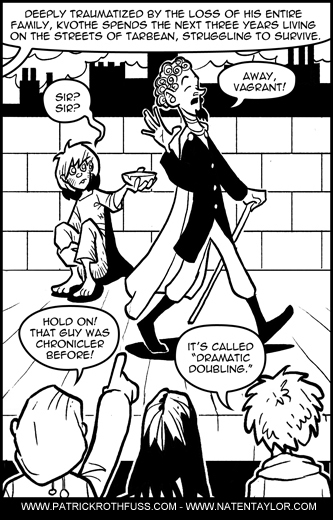 I don’t write straight-up humor very much these days, so it’s nice to know I can still pull it off when I need to. Also? I’ve discovered that it’s disturbingly easy for me to write in Rick’s voice. I don’t know how I feel about that, or what it might mean about me, as Rick is, at best, a dangerous sociopath. 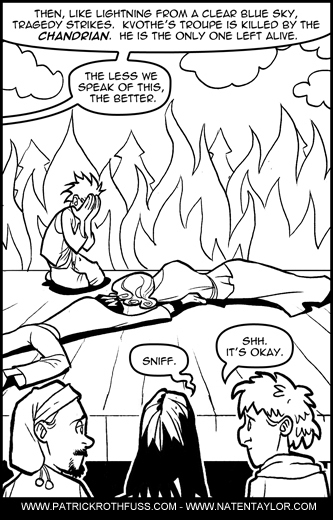 But I’m not going to lie, it made working on some of the scenes *way* easier. It’s been a real experience working with a team on a project. My co-writer Jim Zub and Troy Little have been very kind and patient with me and all the delays I cause. To say nothing of the editors, letterers, and the people who actually own and control the IP that I’m writing in. (Cartoon Network and Wizards of the Coast). Simply said, I’ve learned at *lot* working on this project. And honestly? That’s one of the big reasons I took this gig when I’ve turned down so many other projects that would have been so fun. 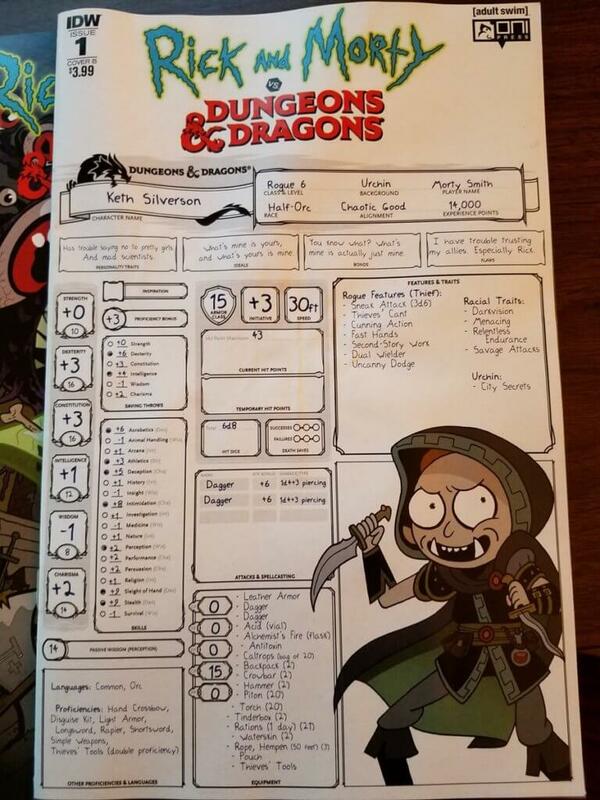 And of course I got to poke some fun at D&D and Rick and Morty too. Because you can’t *really* mock something properly unless you love it first…. But… yeah. It’s on the shelves now. That said, I’ve heard rumors that copies of the comics have been selling out in a lot of stores, so if you want to grab one, maybe reach out sooner rather than later? Okay. And for those of you who are going to be at PAX, here are my panels, events, signings, etc. It’s been a hectic time over here at RothCo. Due to various projects combined with some unfortunate scheduling, I’ve been traveling more than any sane human would ever choose to. How much travel? Well, just for reference, I was only home 16 days over the months of February and March. So much travel that my bones hurt. 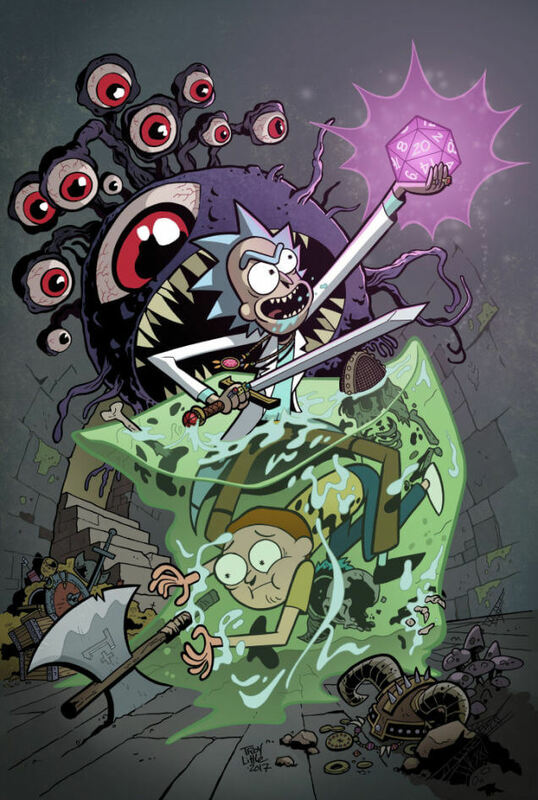 And by “this,” I mean there’s an official Rick and Morty Dungeons & Dragons crossover comic happening. And I’m writing it. I get invitations to be involved with a lot of projects these days, and I say no to the majority of them. It’s my job to say no to things these days so I can focus my energies on essential things, and as a result, I’ve passed on some really cool gigs over the last couple years. But when this got offered to me, I really couldn’t say no. For those of you who want all the official details, there’s a little article about it over on io9. For those of you just want the jist of it. I’m working with Jim Zub and Troy Little. So… yeah. I think the moral of the story is that you shouldn’t ask me to contribute to press releases. There’s other news brewing, and a few blogs I managed to start but not finish while I was on the road. So expect to see them over the next couple weeks. 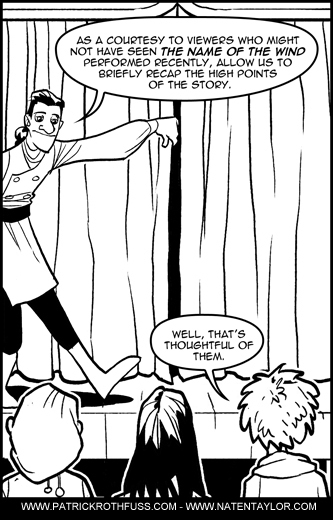 And if you have any questions about the comic, you can ask them in the comments and I’ll take a poke at answering the ones I’m allowed to when I wake up. So during the madness of the book tour, some cool things happened online. Things I would have liked to geek out about in a proper fashion here on the blog if only I’d had the time. Unfortunately, for the vast majority of that month, I was too busy to get a full night’s sleep, let alone write any sort of cohesive blog. 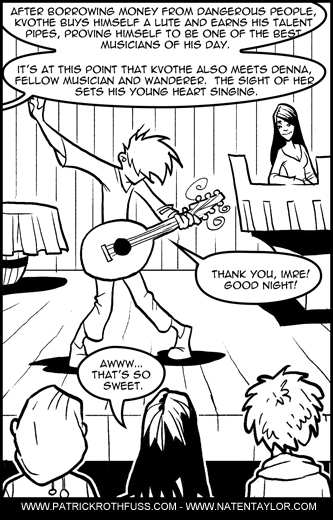 The lovely Greg Dean over at Real Life gave the book a week-long mention in the comic, where he had some fairly cogent (if geeky) musings on the similarity (heh) between sympathy and string theory, among other things. 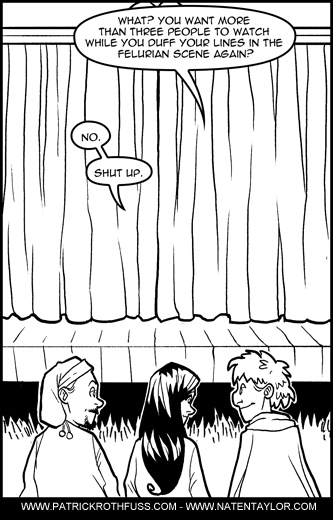 Here’s the beginning of that cameo. Back in the long-ago. Back in the beforetimes. 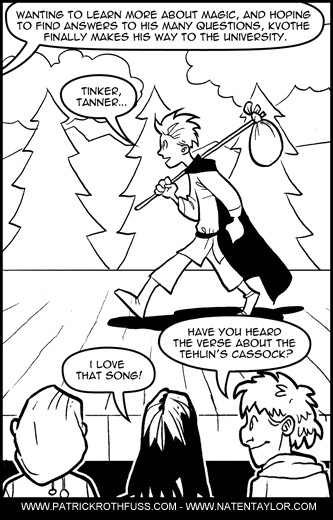 One of my favorite webcomics helped me spread the word about the paperback release of The Name of the Wind. 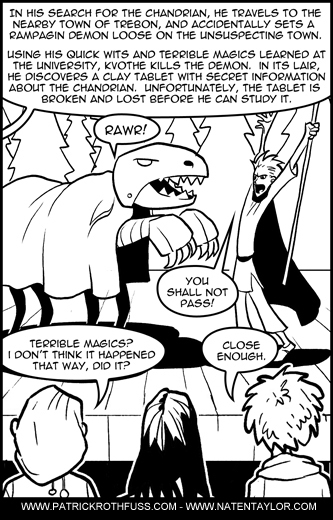 When The Wise Man’s Fear came out, we collaborated on another comic where I got to make a few good old-fashioned D&D jokes. 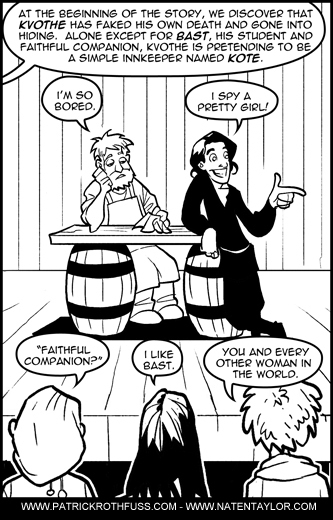 I’ve been fairly open and honest about the amount of love I feel for Girl Genius. I wrote a rather effusively gushy blog about how much I loved Phil and Kaja’s stuff not too long ago. So it’s not entirely surprising that when I stumbled onto a charity auction on ebay that contained some Girl Genius Swag, I was delighted. I hovered on ebay, and crushed all who dared oppose me in the bidding. 1. 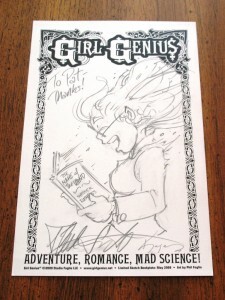 Signed copies of all the Girl Genius books. 2. A personalized sketch that I’ve been looking for an excuse to show off for months now…. 3. 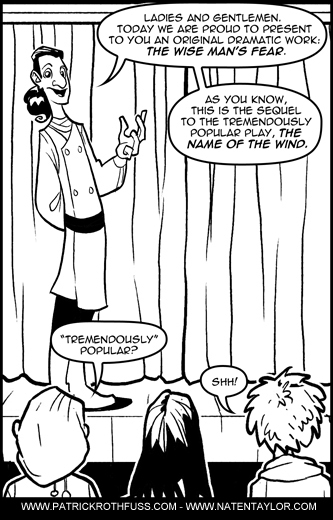 The promise that my name would appear in a girl Genius comic at a time and a place of Phil’s choosing. I was expecting that my name might appear on a street sign, as he’s done occasionally in the past. Or perhaps he might name a disease after me, or something. 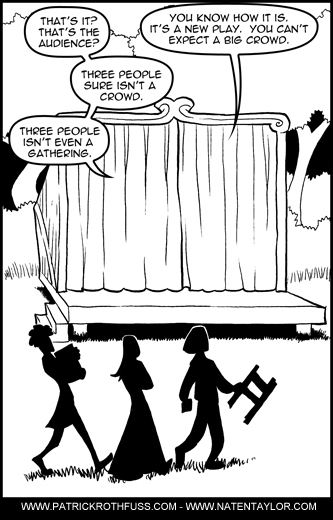 Much to my delight, I actually appeared in a brief cameo…. If you aren’t reading these comics, you might want to consider giving them a lookie-loo, as they’re some of my personal favorites. Over the last few weeks, a lot of people have e-mailed me, asking if a summary of The Name of the Wind somewhere that they can use to refresh themselves before starting The Wise Man’s Fear. There you go folks. Share and Enjoy. 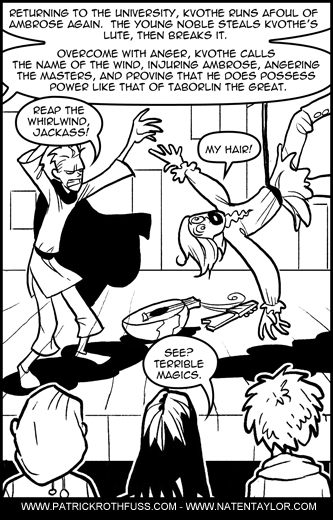 If you would have asked me yesterday, I would have sworn I’d already written a blog recommending Phil Foglio’s work. I would have gone so far as to bet money on it. A lot of money. And, apparently, I would have lost that money. Because today when I went looking for it, I discovered I’d written no such blog. 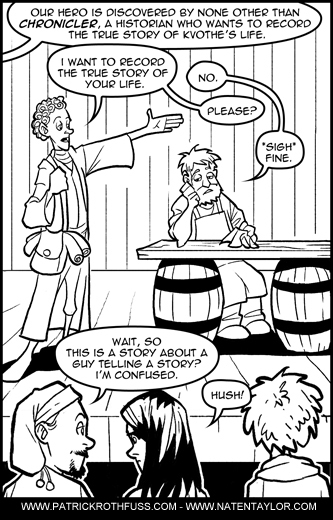 So, in an attempt to set things right, I’d like to talk to you about Girl Genius. I’m guessing a lot of you already know about Phil and Kaja Foglio. They attend a lot of the big conventions. And, if you’re an experienced gamer like me (and by ‘experienced’ I mean ‘old’) you probably remember Foglio’s comic from Dragon Magazine: What’s New with Phil and Dixie. Oh, and they’ve won the Hugo Award for Best Graphic Story the last two years. In 2009 they beat out Joss Whedon’s Serenity comic. And this year they beat out Neil Gaiman’s Batman story. Yeah. That’s right. 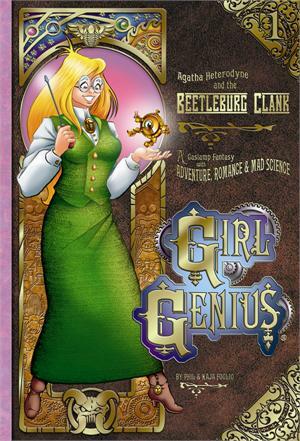 Their graphic novel Girl Genius not only beat out Whedon and Gaiman, it beat Firefly and Batman, too. Did I mention it’s funny? It is. Consistently, honestly funny. I don’t need to tell you how rare that is. It has a strong female lead character who’s good with science, which is nice to see. And it’s perfectly appropriate for just about any age group. In fact, I probably should have mentioned it when was putting together my list of YA recommendations a couple weeks ago. If none of that convinces you, let me say one more thing. 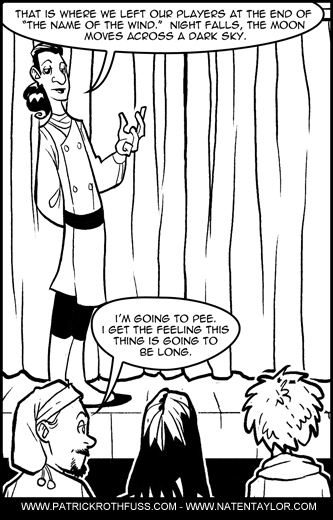 Every time a new volume of Girl Genius comes out, I buy it, then I read all the other volumes leading up to the new one before I let myself read the new one. I haven’t done that with a series since I read Dragonriders back in the 6th grade. 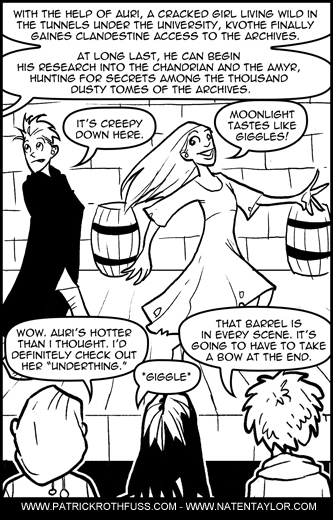 Because Phil and Kaja are really cool, you can read their comic for free over on their website. However, I have to say that the story really deserves to be read in book form, rather than sitting hunched over a computer monitor. I’ve read it both ways and it’s so much more satisfying to read it as a book. In fact, I like this series so much, I’m going to put my money where my mouth is. Here’s my offer. 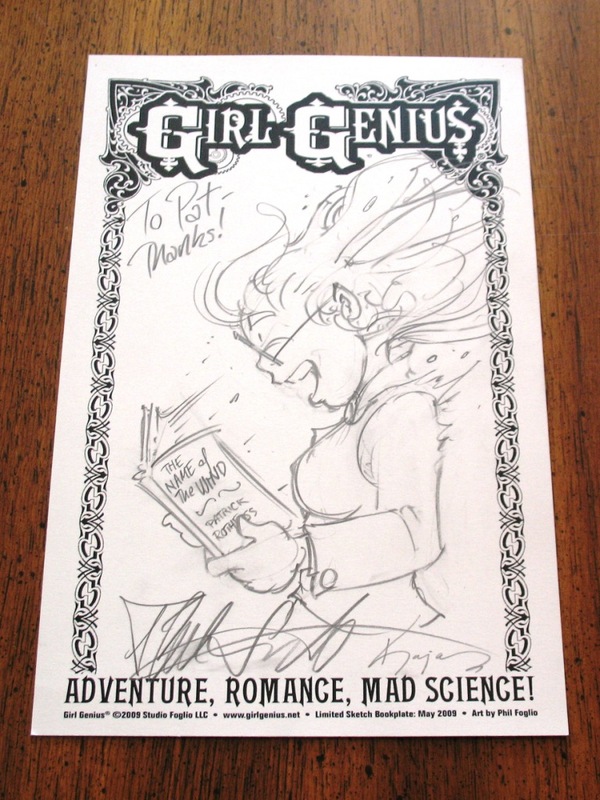 If you buy a copy of the first volume of Girl Genius, and you don’t like it, you can mail it to me and I’ll buy it off you for whatever you paid for it. I’m that sure you’ll like it. If you mail me Volume 1, it has to arrive more or less intact. It can’t be missing pages, crumpled up, or covered in jam. You need to include the receipt showing me how much you paid for it. You need to include a SASE. As I type this, part of me worries that this might be one of my ideas that seems brilliant when I’m typing it, but later, when I’m not full of coffee and love, I end up kicking myself. But you know what? I’m fine with that. 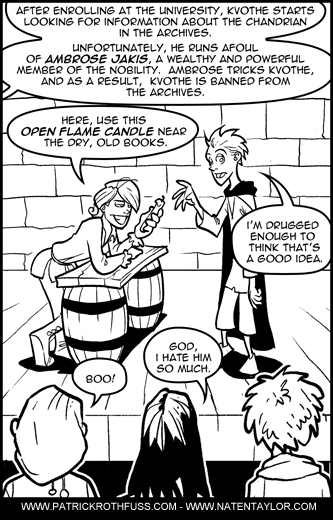 What’s the fun of being a published author if I can’t occasionally do something lovely and foolish? In my experience being clever and careful is highly overrated. Here’s the link to the Girl Genius website. Go on. Order the book. I dare you. Edit: Rest assured that all nine volumes are in print. I know this because I ordered them myself just a couple weeks ago. If you’re having trouble finding them on the girl genius website, you just need to follow this link. 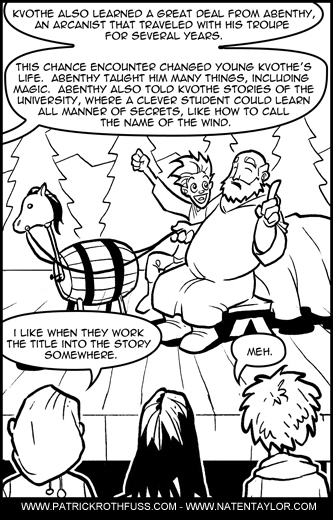 I’ve been following webcomics for a long, long time. 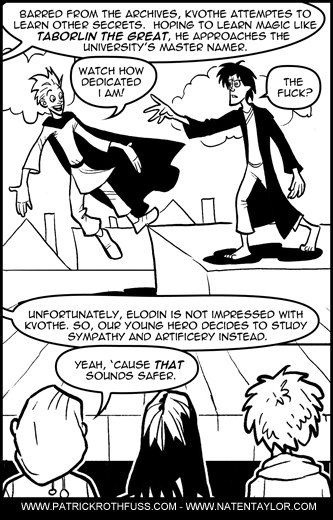 In fact, I think it’s safe to say that as far as webcomics go, I’m pretty well-read. I’ve followed some series for more than a decade. 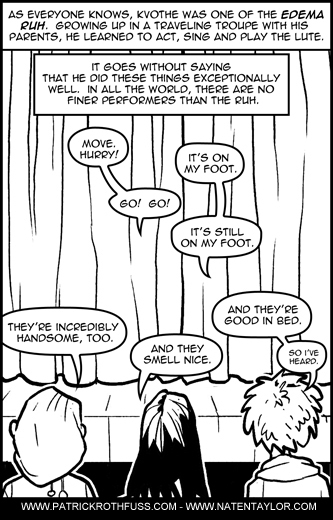 I read Penny Arcade before they were rockstars. I’ve seen comics I love die, and watched others flourish despite having no merit that could be detected with the naked eye. That said, I can’t imagine how I’ve managed to miss Dresden Codak for so long. 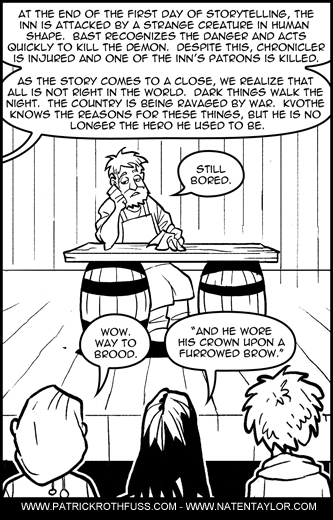 How could go for years without ever hearing about this comic? Oh yeah. I suppose I’ve been distracted by book and baby. Still, I’m more than a little ashamed it’s taken me this long to read it. Anyway, just in case any of you out there are afflicted with the same flavor of withering ignorance, I thought I’d bring it to your attention. If you want a taste of the comic, I suggest reading this one and this one. Both very different from each other, both showcasing different pieces of the artist’s particular genius.